Neuroectodermal origin: The structure is similar to normal choroid plexus, and it is formed of epithelial cells. Growth to large size: Although the tumor is sometimes diagnosed in utero, most tumors reach a large size before becoming symptomatic. Their intraventricular location results in no focal neurological deficit, and symptoms arise when hydrocephalus develops. Intraventricular location: The majority (75%) of tumors arise in the lateral ventricle, usually the atrium (52, 66), with a nearly equally large number arising in the fourth ventricle (30–40%, less common in children, more often seen in adults) (64, 72, 73, 87). They arise only rarely in the third ventricle (5–10%) (1, 75, 91). A small proportion of patients have tumors at multiple locations (3%) (98). 10–15% of choroid plexus tumors: Only 10–15% of choroid plexus tumors are choroid plexus carcinomas (8, 32, 52, 54). Invasive: Macroscopically, choroid plexus carcinomas are friable and cauliflower-like. They usually adhere to the ventricular wall and may invade the adjacent brain. Dissemination: Choroid plexus carcinomas have a propensity to disseminate and recur (55); unusual cases of dissemination have been reported, either in the spinal canal without cranial lesion (6) or metastasis in lungs and bone (26). Very rarely, a choroid plexus carcinoma results from a secondary malignant degeneration of a choroid plexus papilloma (20). 80% of choroid plexus tumors: Most choroid plexus tumors are choroid plexus papillomas. Macroscopic appearance: Choroid plexus papillomas are pink-grayish tumors that look like cauliflower. Can be extraventricular: Choroid plexus papillomas sometimes appear in extraventricular locations (31). < 5% of choroid plexus tumors: Choroid plexus adenomas have been reported as case reports (25, 87). Microscopic appearance: The neoplastic cells are arranged in tubular structures. Rare: There are only 4 pediatric case reports published, with tumors arising from either the third ventricle (3) or the lateral ventricle (82, 101, 102). Most are described as adherent to the ependymal walls. Metastasis from neuroblastoma, Wilms’ tumor and melanoma have been found in the choroid plexus (4, 35). Lymphoma, chloroma, and meningioma can sometime be seen as a single choroid plexus mass (14, 35). Teratomas are sometimes the pathological diagnosis of a choroid plexus lesion (42, 74). Found in 1–2% of general population: Choroid plexus cysts are present in 1–2% of the general population. Small: Choroid plexus cysts are usually < 1 cm and are asymptomatic (60). Glomus: The cysts are usually in the glomus of the ventricles. Sturge-Weber syndrome: The choroid plexus is enlarged, with replacement of normal choroid tufts by thin capillaries leading to the formation of angiomatous cavernomas (34, 46, 81). Tuberous sclerosis: Enlargement of the choroid plexus is seen with leptomeningeal enhancement in tuberous sclerosis (48). Klippel-Trenaunay-Weber syndrome: Marked choroid plexus enhancement is present in association with leptomeningeal enhancement and subcortical calcifications (35, 90). Vascular malformation within choroid plexus: Cavernous angioma, hemangioma, and arteriovenous malformations can be seen (17, 64). They are often associated with malformation of the vein of Galen. Diffuse villous hyperplasia: Bilateral enlargement of the plexus is associated with hydrocephalus – enhances homogeneously (16, 28, 41, 58). Lipoma of choroid plexus: This condition represents a maldifferentiation of the meninx primitive (5, 15, 94). Choroid plexitis: Plexitis can happen with some disseminated pathogens (CMV, Mycobacterium tuberculosis, Cryptococcus, toxoplasma) and is seen as an enlargement of choroid plexus with enhancement (19, 37, 47, 56, 58, 89). Xanthogranulomas: Xanthogranulomas would be seen as an enlargement of choroid plexus, with calcification; hyperintense on T2-weighted MRI, smooth wall, often bilateral (45). Inflammatory pseudotumor: An inflammatory pseudotumor would present as a spontaneous mass in the atrium of ventricle with hydrocephalus and perilesional edema, and homogeneous enhancement (13, 35, 68). Possibly autosomal recessive inheritance: Familial occurrence of choroid plexus papilloma has been reported with consanguineous parents, raising the question of whether there is autosomal recessive inheritance (96). X-linked Aicardi syndrome: The tumor is also seen in Aicardi syndrome (infantile spasms, agenesis of the corpus callosum, lacunar chorioretinopathy, and X-linked dominant character) (84). While there is no direct relation between SV-40 and tumor genesis, there is an increased tendency to develop cancer in an exposed cohort; and SV-40 has been shown to induce choroid plexus papilloma in rodents (9, 27). Multiple chromosomal imbalances: Imbalances in chromosomes have been found in both choroid plexus papilloma and carcinoma (72). Histology anaplastic: The histology shows some solid sheets of tumor cells, nuclear pleomorphism, atypical and frequent mitosis, as well as areas of necrosis (MIB > 8%). There is a blurring of the papillary features with the cuboidal-columnar epithelium lining covering fibrovascular cores. There are areas of necrosis. 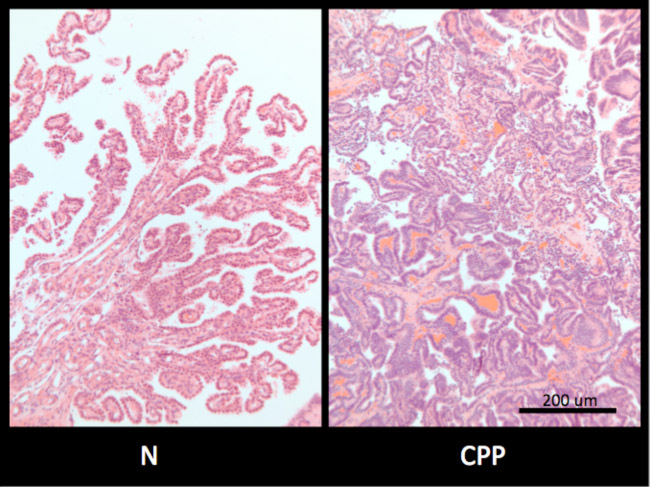 Immunohistochemical staining: Positive for CAM 5.2, INI1, KIR 7.1, Stanniocalcin 1; can be positive for transthyretin, GFAP. H & E stain (x10) of choroid plexus carcinoma: The tumor is more cellular, less organized, and composed of cells with a greater pleomorphism and mitotic activity in comparison to normal chroid plexus. Papillary architectural features typically remain, at least focally. 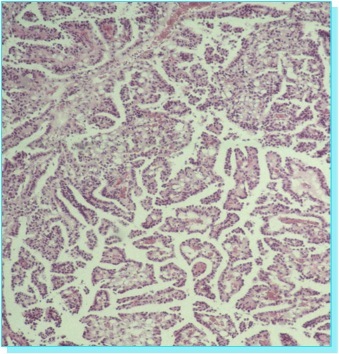 Histology benign: Histology shows uniform cuboidal/columnar epithelial cells covering a lining of fibrovascular connective tissue fronds, with a low MIB-1 (0.3%). Positive to transthyrethin. H & E stain (x20) of choroid plexus papilloma: Typical appearance at low magnification showing redundant papillary fronds highly reminiscent of the normal choroid plexus. The epithelium remains well organized and monotonous without anaplastic changes. 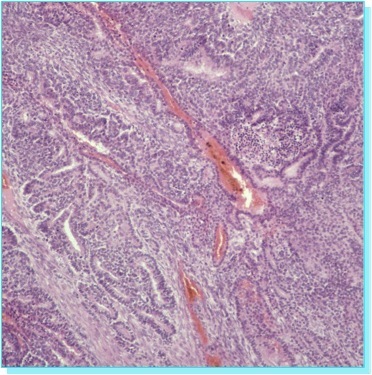 Histology benign: Histologically, choroid plexus adenomas are formed of neoplastic cells making tubular structures, no necrosis, and some mitosis (MIB-1 is variable depending on the cases but seems similar to that of the choroid plexus papilloma). Stains with vimentin, S100, transthyretin, AE3.